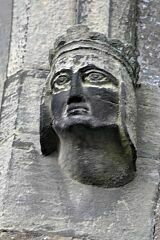 Pevsner describes the building as having a Perpendicular west tower and a basically medieval chancel. 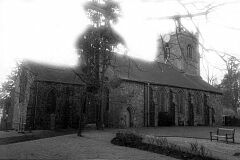 A chapel (dependent on Blaby) was first mentioned in grants and confirmations to Leicester Abbey in the C12th. Parish Church. Tower of C15, the rest of 1841 by H. Goddard. Interior remodelled in 1907 by T.P. Brown. Random granite rubble with limestone dressings and Welsh slate roofs. West tower, nave with two aisles, chancel. Tower has angle buttresses and paired foiled lights to bell chamber. Embattled parapet with angle pinnacles with fleurons above corbels. In the plinth of the west wall a door has been cut through, with a Perpendicular three light window above it. Coped gabled south porch, buttressed south aisle which has lancet windows. Nave and aisles roofed in a single span. Lancet windows in chancel but a three light Decorated style east window. Lancet and wide traceried lights to north and vestry. Inside, the rubble walls are exposed throughout, and the triple chamfered tower arch looks early C14, above it a former roof profile is apparently visible. The three bay arcades are of brick, flat arches with minimal abaci to square pillars. 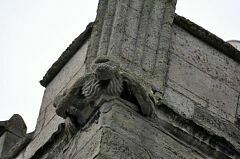 Roof springs from corbels; the tie beams surmounted by king struts. Chancel arch also brick, in the same minimal style as the nave arcades, with a low relief brick cross above it. Wood panelling and reredos to chancel. Medieval font, octagonal with plain panels and moulding above the shaft. Arms of George II over the south doorway. Stained glass; in the east window of the south aisle, by Kempe, commemorating St. Andrew. Undated glass in chancel east window predominantly blue and red, depicting the Crucifixion. 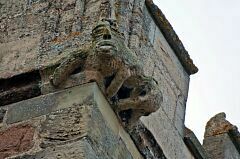 Project Gargoyle survey work in 2011 recorded two human heads on the label stops of the east window from the 1841 church restoration, as well as two medieval grotesques on the 13th-14th century tower. No carvings were noted internally. Pevsner N, 1984, The Buildings of England Leicestershire and Rutland, p142 (Bibliographic reference). SLE4. --- Bibliographic reference: Pevsner N. 1984. The Buildings of England Leicestershire and Rutland. p142.